I’m cheating slightly, and capturing my May returns on the 29 May, during the UK’s holiday weekend. This leaves out the last trading day of May, Tuesday 31/5. In effect this means that 31/5 will become part of my June 16 returns, so it will catch up with me. May has been pretty uneventful from an investment perspective. The FTSE-100 index stayed at around 6300, and S&P remained close to 2100. What else happened in May? The Brexit referendum campaign started to feel like it is the Remainers’ to lose. Certainly the economic argument feels settled. This leaves the sovereignty and immigration arguments still to play for, along with the foibles of random news events and turnout on the day. At the time of writing nothing else of note appears to have happened in May, whatsoever. Against this backdrop, my portfolio returned a positive 2.0%. Against a market weighted-average 0.8%. 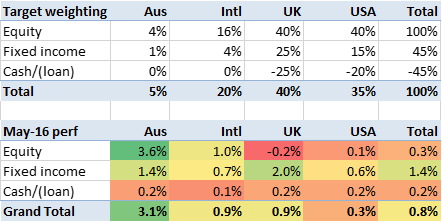 Aside from Australia (up 3.6%, but <5% of my weighting), the only notable thing was that bonds were up yet again – by 2.0% in the UK. The pound was steady against the dollar, but up 2% against the Euro – which will have helped my returns beat the constant-currency market average. Why am I up by more than 1% more than the market? Partly I think because I remain underweight commodities, which had a bad month. Partly due to my leverage – with debt funding a third of my exposure, any underlying gain should be amplified by around half. And partly just noise. How will you be voting? Always enjoy these monthly updates as it gives me something to compare to which isn’t a standard benchmark. I won’t roll up my returns until next week (first Saturday of each month) but for now it looks like it’s effectively a wash (+/- 0.1%) compared to your stellar 2%. @RIT – Thanks for the encouragement. Not sure 2% is ‘stellar’ but the 1 year return of 0.9% compares very favourably to FTSE-100 (down ~10%). While you’re at it, I’d love to know what other material you’d find useful on this blog? Year on year some simple calcs (don’t formerly calculate) suggest I’m down by about 0.4%. So also much better than the FTSE100 but not as good as your good self. I’m a FIRE junkie so I’m probably not the right person to ask the question of as I read all of your posts. For me the value is not in a specific post but in the thinking/themes that come from the sum of all the posts. Our goal is the same – FIRE – but our approaches are very different. You are looking to build a ‘lot’ of wealth which will enable you to stay in London and still have plenty of consumption. My approach is a ‘lot less’ wealth which is only possible by a move away from the South East and the opting out of a lot consumption. Same goal with very different approaches and I’m fascinated to see how both play out.